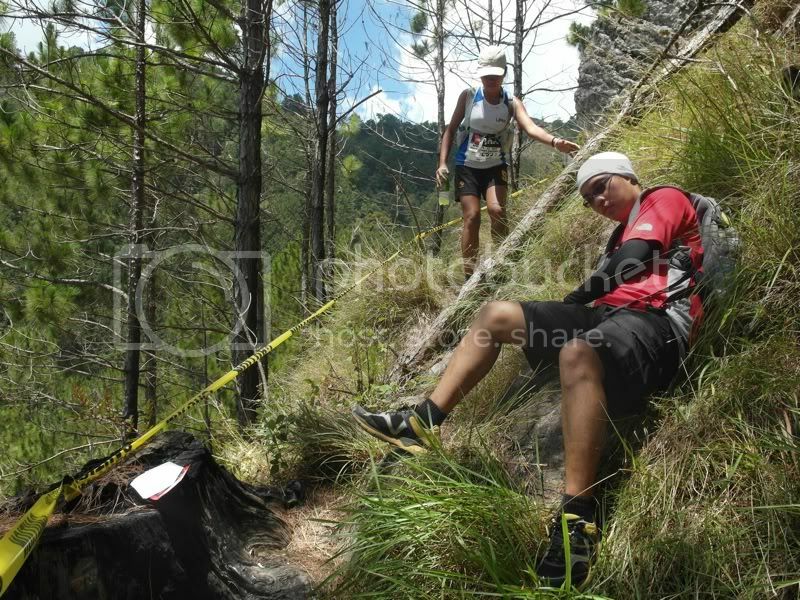 this entry was supposed to have been about my valiant effort to finish the 50K category of the north face 100 philippines 2012, which took place in baguio city over the weekend. i was supposed to talk about how i caved in to the complaints of my forgetful legs -- legs which seem to have no memory at all of climbing mountains -- and my ignominious exit from the race. i would have harnessed all my talents as a wordsmith to convince everyone -- myself most of all -- that there ought to be no shame in not finishing the run, that covering 23 kilometers over unbelievably difficult terrain is still some measure of accomplishment. i would have written this to illustrate my lack of regret for quitting (or at least, my denial of having any) since my personal safety was still priority. but there will be no such story. against all odds, i finished more than 50 kilometers of what still feels like pure evil, with just over 11 minutes to spare. to be perfectly honest, i only registered for the TNF 100 in order to get huge discounts for stuff i needed on my climb to xueshan. i was hoping to sell my bib to someone more inclined to this kind of cruel self-flagellation at a lower price. i was unable to get myself to commit to any form of training: between taiwan and baguio, i had only done mount pulag's ambangeg trail, the recon run of the salomon x-trail, and a few road runs, the cumulative distance of which did not even exceed my last foot race. on the last two practice runs, i laced on my trail runners to decide which i would use on race day. i was still somewhat unconvinced that i should not be running the race despite my lack of ample training. 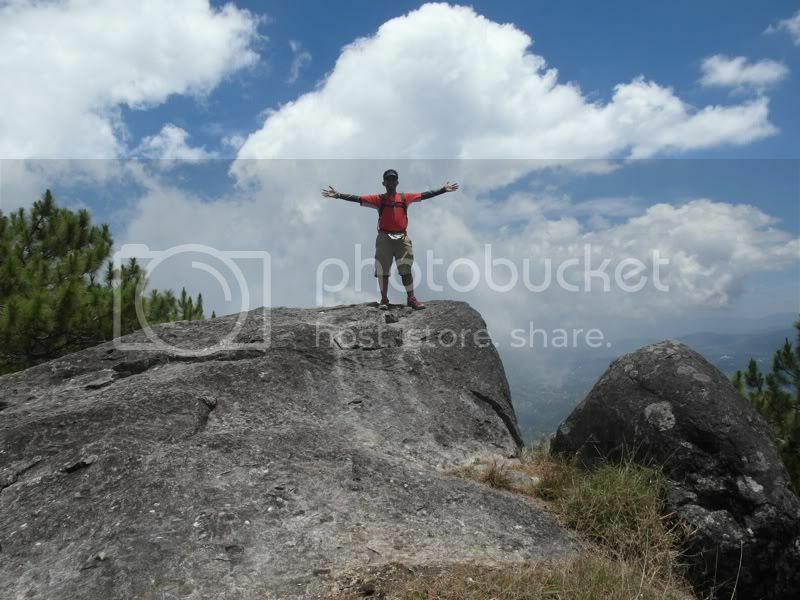 in fact, up until my long bus ride to baguio, i was uncertain whether i would push through. on the friday that i left for baguio, i had not slept a wink on the slow-moving bus. i arrived in the city of pines at a quarter to 2AM, and haggled with a hotel receptionist to allow me to just deposit my bags instead of checking in. i said i would have no use for a room at that time, and would only be returning after 10PM later that same day. i changed into my running attire in the toilet, decided what i would be stuffing inside my orange TNF gulper at the lobby, and took a cab to camp john hay. when i arrived, they had just flagged off the 100K runners and i cheered deliriously for friends who were competing. i was still dizzy from lack of sleep and i wasn't sure if it was healthy that i hadn't carbo-loaded a day prior to the event. there are unfortunately no decent places to eat in any of the bus stops. after catching up with the race director on what i needed to know, i stood in the middle of a small crowd of people whose foreheads were shining with headlamps. only then did i realize: yes, i am in this event, and running it. but then again, i wasn't looking towards a finish. i just wanted to see how far my legs would take me. at exactly 4AM the gun was fired, and i was running slowly on the dimly-lit asphalt of camp john hay. no more than 500 meters later, i took a right into the pitch-black pine forest, and began following the runner in front of me. there were buntings scattered sparsely among the trees, so very early on i had made a wrong turn along with a few other runners. in the distance someone was flashing a light and shouting: "runners!" i am still unsure what fueled my legs at the time, but i was in fact, just playing along, throwing the light of my lamp on the trail to make sure i wouldn't trip over a rock or a root. 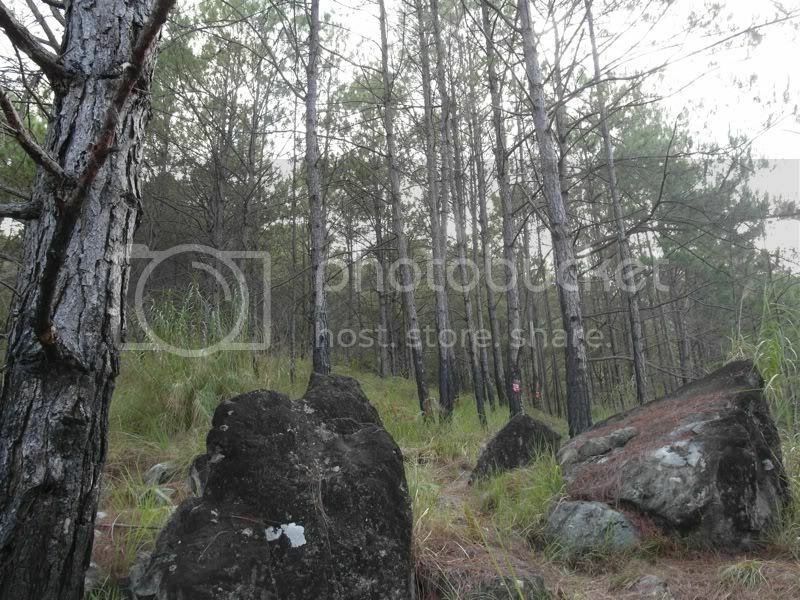 even then i couldn't believe that there were forested trails in baguio city still, and so deep into the woods that i could not even hear the roar of passing vehicles. because in fact the yellow trail goes around in circles for about 8 kilometers close to public roads. 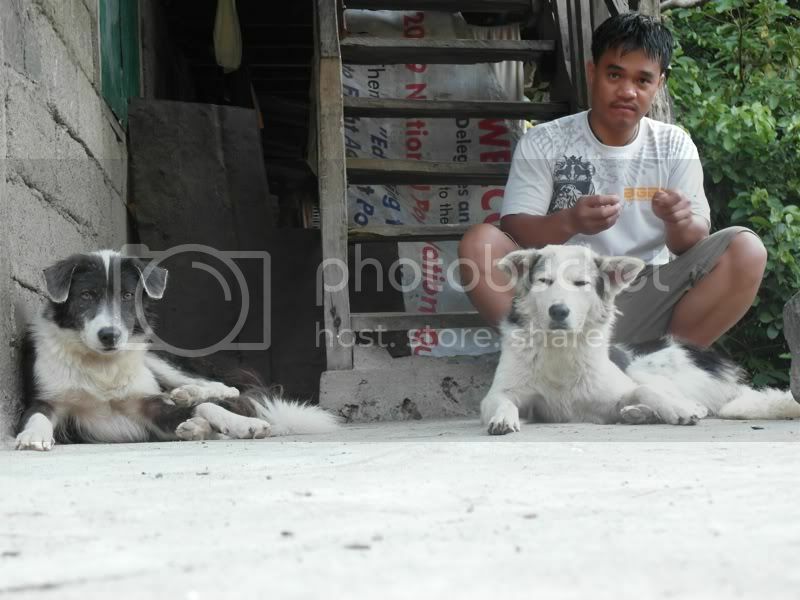 just as the sun was rising, we ran out onto narrow barangay roads patrolled by the neighborhood gang of unleashed dogs, and eventually ended up on the strip of the loakan airport. there was a nice-looking helicopter parked outside the terminal building. locals were jogging on the runway itself. it was at this point that i began to slow down, and began walking. at the aid station, i loaded up on 100 plus and a banana, and realizing there was still 40 kilometers between me and the finish line, i decided to take it easy. 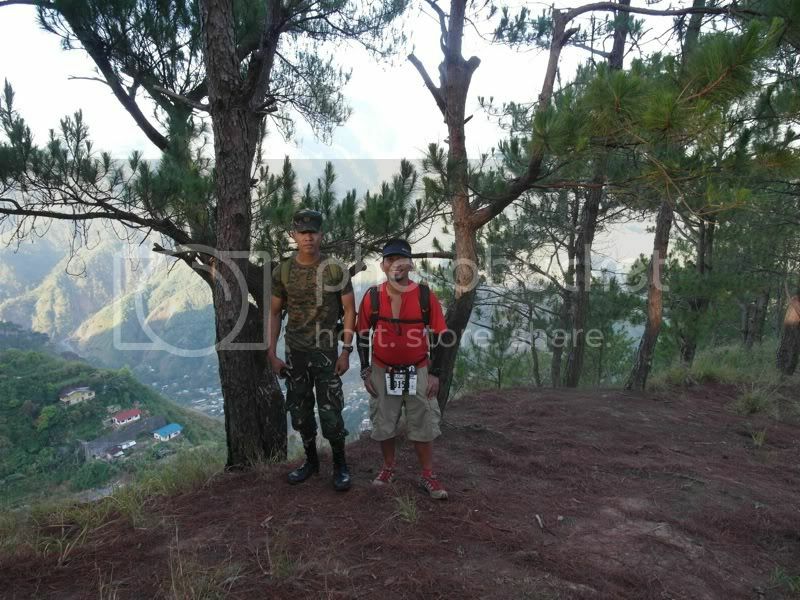 we left the road once again and ran a trail parallel to the runway, and began to descend a single track to kennon road. there were four talkative runners in front of me. one girl was wearing a yellow skirt with feathers on the trim. i would have wanted to overtake them all, seeing as they didn't seem to be in a hurry, but i couldn't, lest i plunge into the rusty pile of roofs below. 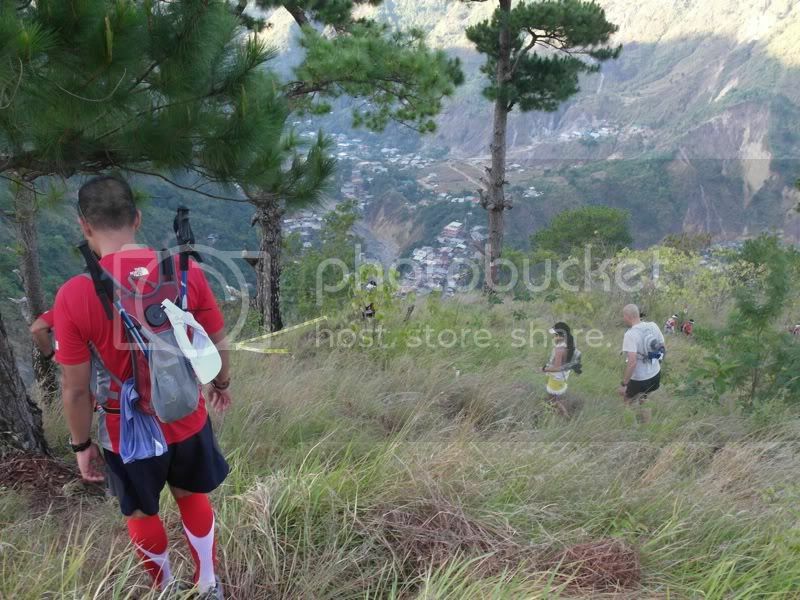 the moment we reached kennon road, other runners began to pick up speed. i went to the nearest store and had a softdrink. 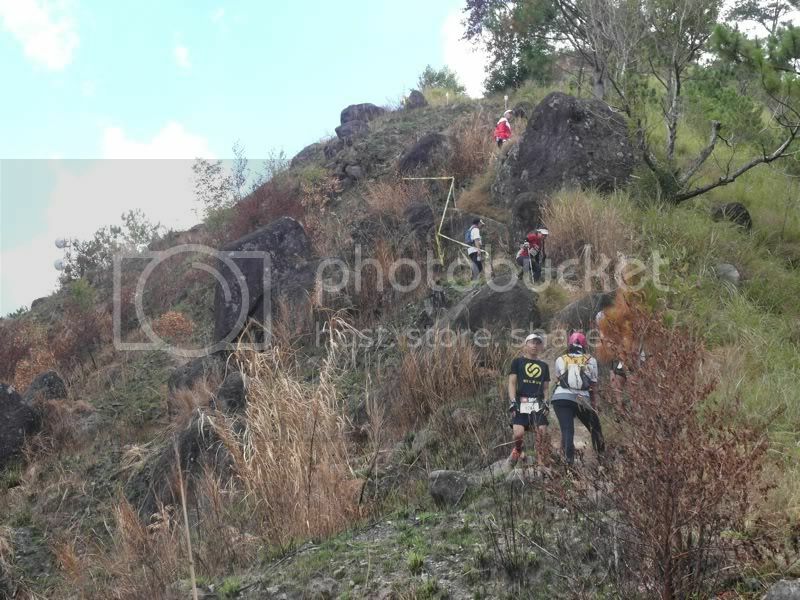 ahead of me was the most difficult part of the trail: an uphill battle to the santo tomas relay tower, an ascent which took me over six hours. it was extremely hot that day, and i pined for sleep. there were parts of the steep trail where a gentle breeze blew and i took many take 5's, letting other better-prepared and better-trained runners to go ahead. i had expected to be better during the ascent, having carried 40-pound backpacks over more difficult terrain, but i could not seem to summon my mountaineer's legs. it was just after the baguio water district where i first encountered the elite runners returning. it was unbelievable. there i was with other slackers, relaxing and taking our sweet time, and these guys were rushing down like they couldn't get injured descending at that speed. i cheered them on although i'm not sure if they appreciated me telling them their respective rankings. meanwhile, i had to deal with my own travails, and pushed myself up the trail the best i could. i began to strike up conversation with people whose names i didn't manage to ask, but whose encouraging words meant so much to me, they fueled my late evening finish. the trail from kennon road to the satellites on mount kabuyao is thoroughly wild, although there are fantastic views in some areas. i almost forgot i was in a race when i stopped frequently to take pictures. the irony of it all is that when you finally reach the pair of satellite dishes, there's actually a concrete road and a huge community. it was at this aid station where i stopped the longest. a volunteer mixed me a cup of cold milo, and another one helped me refill my bladder. if i wanted rice, they said, the locals had cooked lunch. so it is actually possible to provide logistics in an ultramarathon. take that bataan death march ultramarathon! i lingered longer than reasonable, watched as iker karrera wolfed a few bananas with his game face on, and joked so much about not continuing that someone actually approached me to ask if i was really quitting. there were already a few runners there waiting to be ferried back to camp john hay. perhaps i was supposed to say yes, but i reacted with a scowl: "no!" i filled a bottle with gatorade, and went off for the clump of towers in the distance. on the last ascent, i was wincing in pain from a pair of cramps, but concerned runners told me that a massage was available at the turnaround point. that egged me on, actually, and i lay down on a tarp while a lady pressed liniment on my thighs. i was expecting some form of denouement to possess me when i finally circled back, but all i could think of was: i still have 25 kilometers left! looking at what was left of the trail, i could see loakan airport. it seemed so impossibly far, that i would hesitate to walk there, even if the trail was flat. 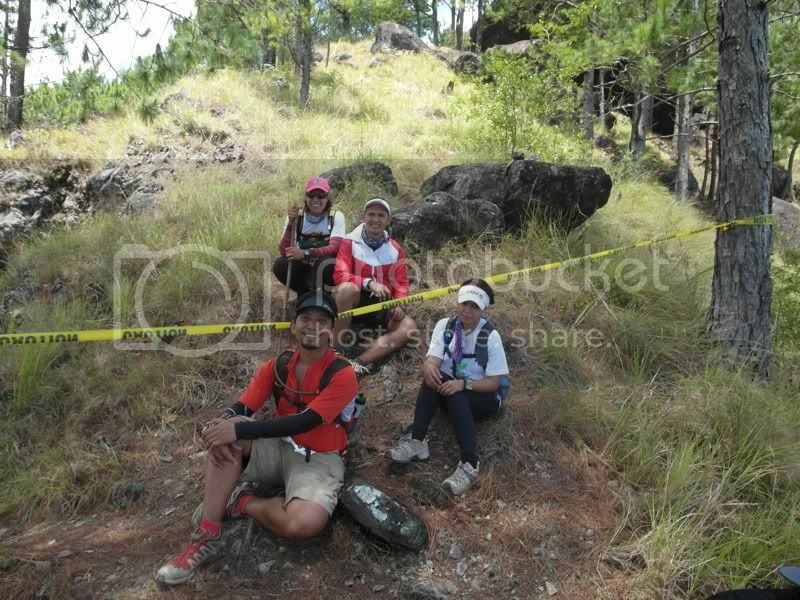 the only consolation was that about 10 of my last 25 kilometers were right up my alley: i am pretty good in the descent, so much so that the two guys who requested that i wait for them called me "halimaw". later on, going back up to loakan, i let them go ahead. when i reached kennon, i decided to stop at a store and have a snack. it was already close to 6pm, and i had nothing that day but two snickers bars, a banana, a small camote, and some oatmeal cookies. i was not sure if i was weak, in pain, hungry, sleepy, or all of that at once. with just four hours between me and the finish line, and my last chance for getting extracted (one lady runner ahead of me hailed a jeepney the moment she reached the road), i decided to continue. i was walking slowly once again, pausing every few steps, looking back. 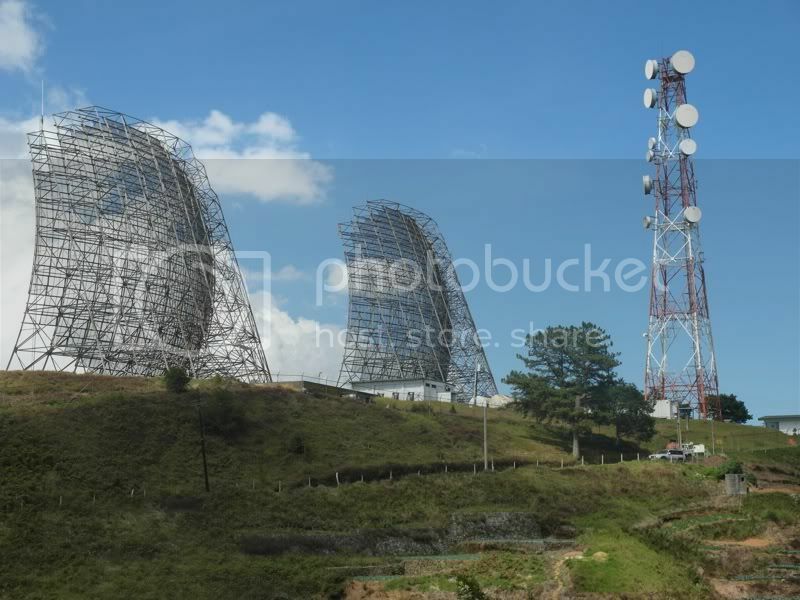 behind me, mount santo tomas appeared like a giant blue silhouette, the outlines of its towers piercing the empty sky. pretty soon, the view was replaced by a brooding night sky without stars, and i entered the forest in darkness. several runners in the 100K had already overtaken me, climbing as though they just hadn't covered more than 80 kilometers. the way to loakan seemed confusing, and longer than i remember it. at that point, marshals were giving me conflicting feedback. i doesn't really help a lot for anyone to tell you that you have little left, when you still have more. it pains the mind, which at this point, was the only thing that kept me going. i wasn't about to give up knowing there was just 10 kilometers between me and my quarry. but an hour later, someone tells you the same thing: still 10K to go. i got really pissed at loakan airport when a marshal informed me that they had moved the cut-off to 1AM, and that i had less than 7K left. this actually was a disincentive from running. it was only when i realized that i still had to run part of the yellow trail that i began to pick up speed. two of the runners from the only group ahead of me had quit with 5K to go, saying they could not possibly finish with just an hour left. i was almost in a state of panic. then one other runner, who accompanied me on the ascent, but who lagged behind going down, caught up with me. his two companions had quit, but he forged on, so i told him to go ahead since i couldn't run anymore, and we had very little time left. i complained severely to the marshals who were just as lost as i was, and after a while, i found the other runner trying to find the trail. i pointed to the marker he missed, and when a group of volunteers flashed a blinding light on me confirming that we were already in camp john hay. "cutoff na ba kami?" i whined, and they said i still had 15 minutes and about 400 meters of asphalt road between me and the finish line. despite what i had just said earlier, i began to run. and run i did, clocking in a 17:48:43 finish time. i was one of the last two to finish. there was no fanfare when i arrived. no one seemed to notice that i was about to finish -- the marshals and volunteers were probably exhausted as well. i had to pick up the finisher's tape just so i could pretend at least my accomplishment was worth celebrating. immediately after, i took a cab with complete strangers so that we could leave camp john hay. i was being invited to the filling station to celebrate my finish. but when i arrived at my hotel room, i crashed. i could barely drag myself to the shower to wash off the grime of nearly 18 hours on that trail. i was hungry, i was in need of a pair of ears to listen to my story, i was delirious. but i was also very exhausted, and my body was in great, unimaginable pain. i applied liniment on my legs, popped a pain killer, and slept with the TV on. i expected to sleep till noon the following day, but my body remembered it had not eaten well, so i woke up at 8 and limped to the buffet where i had 3 plates of traditional pinoy food. i wasn't quite sure if the food was good, or if i was just famished, but i had a lot to eat. back at camp john hay, i picked up my token -- a barrel man which the organizers thought might have been a cheeky way to commemorate our finish, but is actually a rather patriarchal symbol of virility. the rather unintentional sexism is forgivable since i'm not a feminist anyway. i watched as trail superstars enjoyed the boodle fight, picking up food with their hands, and -- giving in to filipino tradition -- having some gulps of beer. until now, i have yet to completely grasp the profound, if not sublime beauty of this exhausting exercise. when people ask me why i did it, my answer is a terse and unphilosophical: "para pahirapan ang sarili ko." i could probably offer a few explanations why i decided to join and finish when everything else suggested that i give up: to test my limits, to break boundaries. perhaps i should relish in the fact that despite the punishment that i've willingly submitted myself to, here i am telling this story, able to walk albeit with some struggle. i have said it many times and i say it again: it is not so much that it is something i must do, or that i could in fact do it, but that i might have felt it impossible to do at one point that makes it more worthwhile. i feel more alive knowing that i can push through the pain, for no great thing is ever easily achieved. i'd probably suffer so much more at a conventional marathon pops. the monotony of the road would bore me to death! haha. thanks! of course you do. haha. salamat!